Don't fear the Heat. Just because it's hot outside doesn't mean you need to sacrifice your run. Just adjust a little bit and you can get a great workout in half the time. 10 Quick Tips for running in the heat. 1. Drink water... Duh... yeah but make sure you bring water with you and plan to stop for more water if you can. On a hot day, 90 degree +, you will cook through water about twice as fast as you expect. Don't ration water. Drink when your thirsty and if your getting low, then shorten your route. 2. Slow down. Remember you're getting twice the workout than your body is probably used to. Don't be afraid to walk. I walk all the time and I'm in pretty good shape right now. On a long run if you start to get tired, slow down or walk. Most likely your cardio is fine, it's your body temperature that is rising too fast. Get your body temperature back down by taking it easy. 4. Don't be afraid to wet your shirt before you leave and during your run, but don't use your water supply. This is an awesome trick but don't do it at the expense of using your carried water supply. Water does much more good in you than on you. Even if the water you find is warm, the evaporation will cool you off. This is how a swamp cooler works. 5. Wear sunscreen. The easiest way to overheat is to start to get sunburned. If you skin doesn't start to burn and get red then that blood is not on the surface getting hotter and hotter. Always wear sunscreen on a hot day, even if you're tan. 6. Bring your cell phone. I always bring my trusty CamelBack on hot runs. It gives me a great way to carry my cell phone in case I get hurt or can't make it back. 7. Make a decision before you run on what your rules are for distance versus bringing water or not. I have a rule of thumb: Anything over 3 miles in the summer, I bring water. I don't wing it on the way out the door either. This has kept me out of trouble many times. 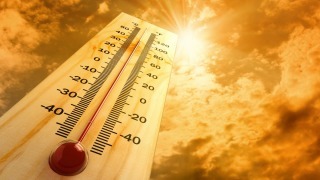 Remember the weather can change very quickly and go from overcast to crazy sunny and hot very quickly. 8. Drop a note to someone on your basic route. I usually text my wife that I'm going running in a general location. That way if I do break my leg I know help will get there in a few hours, not days. 9. Bring an energy gel just in case. Running in the heat tends to cook through your glycogen levels much faster than a cool day. I'm a low carb athlete but I still carry high carb energy gels with me in case I hit the wall and start to feel sick. 10. Slow the F down if you start to feel sick or dizzy. Most people never remember the moments before passing out. You will not see it coming if you ignore the basic signs. If you start to feel sick to your stomach or even a little dizzy, then start walking and sipping water. Wait for about 5 min after you start feeling better to start running again. Don't fear the heat, you get a great workout and usually don't need to put in as much time as a cool day. Slow down and enjoy the increased fat burn. Just be careful and take care of yourself.